First found in a river in Sicily between the 4th and 3rd centuries BC, Agate is a banded Chalcedony, a mineral of the Quartz family. Known as the “earth rainbow,” it’s found throughout the world, and there are perhaps thousands of types, typically appearing in stripes, “eye” markings, colored specks, fossilized inclusions, or no color at all. 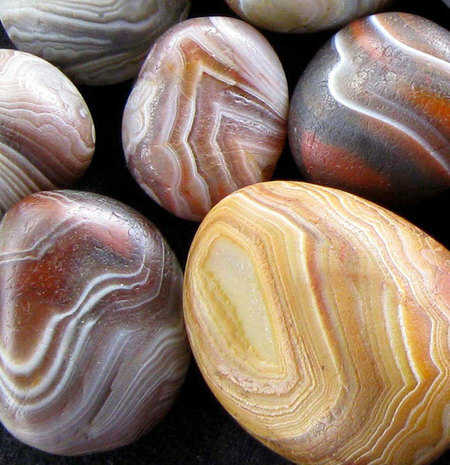 Ancient Islamic and Babylonian peoples thought Agate could ward off evil. Long ago Egyptians and Persians prized it as protection against natural disasters. Ancient Chinese expected it to cleanse their minds, making room for good fortune. Medieval peoples tied it to the horns of oxen to bring about a plentiful harvest. It’s believed to be the middle stone in the third row in the breastplate of the High Priest in early Israel. Agate is a translucent, semi-precious stone whose color is caused by embedded minerals, typically iron oxides and hydroxides. A seven on the Mohs scale of hardness (ranging from 1-10), Agate is a relatively inexpensive gemstone which, when cut and polished, becomes cabochons, beads, cameos, statuary, knife handles, and other ornaments. Children’s marbles — “aggies” — once were made from polished agate. The zodiac stone for Gemini (May 22-June 21) and the mystical birthstone for September, Agate’s Chakra healing energy depends upon the color of the stone. For example, Blue Lace Agate clears the throat Chakra; Fire Agate stimulates the base Chakra; green Agate is beneficial for the heart Chakra. 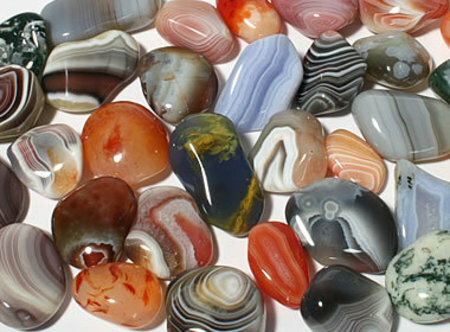 Likewise, Feng Shui experts believe the different varieties of Agate resonate to different purposes. Agate is said to be helpful for digestion, headaches, arthritis, fever reduction, throat conditions, and physical strength. It’s believed to help you overcome addictive behaviors, heal bitterness of the heart, improve communication, banish fear, and improve longevity. Clean your Agate with warm soapy water and a soft brush. Avoid exposure to heat and harsh chemicals.